Top Of The Rock Observation Deck 8:00am-12.00am (daily); ticket office closes at 11:00pm; last elevator up at 11:00pm. The complex is located between Fifth Ave., Sixth Ave., 49th St. and 52nd St., includes 19 buildings and was built by John D. Rockefeller Jr. The 22-acre (89,000 m2) Columbia University property was leased in 1928 under an 87-year lease. Initially, the project involved the collaboration of the Metropolitan Opera for the construction of a new theater, but this withdrew after the severe economic crisis of 1929. Work began on May 17, 1930 and was completed on November 1, 1939 with the construction of the first 14 buildings built in Art Deco style. The main builder was John R. Todd who followed the design of three architectural studios coordinated by Raymond Mathewson Hood. In addition to Hood there were Reinhard & Homeister, who specialized in office design, and Corbett, Harrison & MacMurray, with the young architect Wallace Harrison who later became Nelson Rockefeller's principal consultant. The construction of the project employed over 40,000 people. In the 1960s and 1970s, four more towers were built along Avenue of the Americas (6th Ave.). In 1985 the Rockefeller Group bought the land from Columbia University for $400 million and in 1989 the entire complex was sold to Mitsubishi Estate, a real estate company of the Mitsubishi group, which acquired control of the entire Rockefeller Group. In 1996 the property was transferred to a consortium comprising the Goldman Sachs group (with 50%), Gianni Agnelli, Stavros Niarchos, and David Rockefeller and finally in 2000 was acquired by Tishman Speyer Properties, L.P. 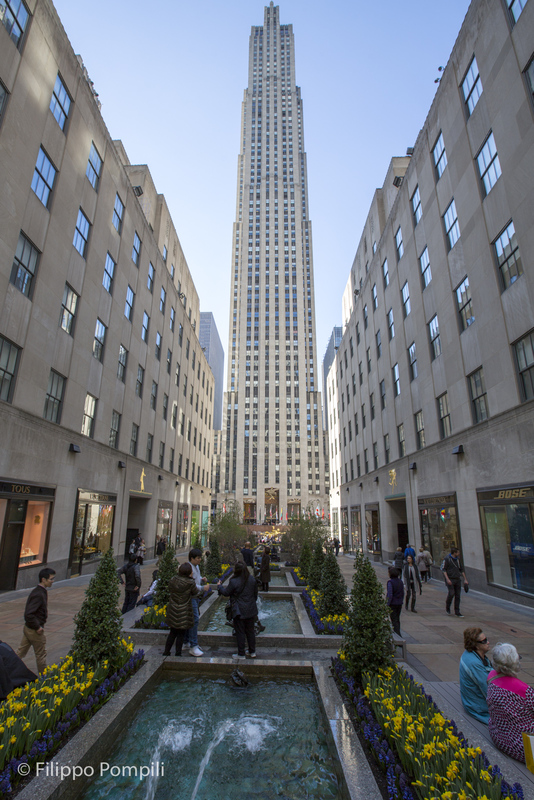 The tallest building, with its 260 m, is the 30 Rockefeller Plaza, called RCA Building between 1933 and 1988, then GE Building from 1988 to 2015, and finally Comcast Building from July 1, 2015. The plan is divided by a T-shaped square, the long part has a long central fountain while the other is characterized by the Lower Plaza with a fountain dominated by Prometheus, a bronze statue gilded 5.5 m high and weighing eight tons, made by sculptor Paul Manship in 1934. During the winter this area turns into a large ice rink and during the Christmas holidays it is decorated with a thousand lights and a large Christmas tree. The Radio City Music Hall is also part of the same complex. The art deco theatre has a capacity of over 6,000 seats and offers a stage with infinite solutions thanks to its mobile scenes. You can visit it by participating in the Radio City Music Hall Tour.